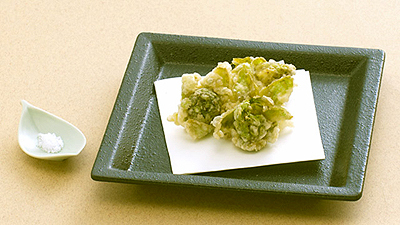 The small flower buds of giant butterburW, known as ‘Fuki’ in Japanese is the the phrase used to describe this season. The Fuki buds are called ‘Fuki-no-tou’, one of the less plants that you see on the frozen ground at this time of the year. 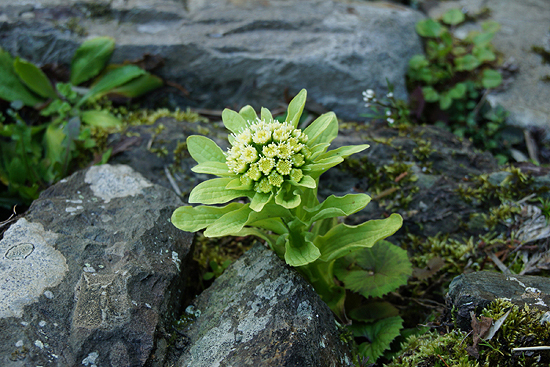 The bulb-like buds of Fuki is like little green ball on the ground, small, but quite eye-catchy that would be easily found on the ground with dead leaves or layer of snow. It has been long known to the Japanese as a symbol of early spring which can be seen or read in classical Japanese paintings and poetries. The phrase starts with the word ‘Fuki no’ meaning, Fuki’s. The following word is ‘hana’ which is a noun meaning ‘the flower’. The last verb, ‘saku’ means to bloom. If you read the phrase as it is, the time is still not yet for the flowers of Fuki to bloom so here, you would have to use your imagination thinking about the thoughts of people at this time of the year, looking so much forward to the end of harsh winter, which the ‘blooming’ is the hope. Fuki-no-tou tempura. Early spring dish! Photo from Daiichi Sankyo Co.Ltd. Official Site. Fuki-no-tou are eaten, before they flower, as tempuraW, stewed or in misoW soup which are seasonal menu that you can enjoy only at this time of the season feeling that spring is almost here. Mikan, kotatsu and cat all together. Familiar winter scene in Japan. Mikan or Satsuma mandarinW has been the most familiar fruit to the Japanese at this time of the year for long. 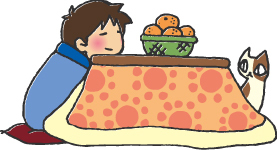 It has been one of the items that represent ‘Japanese winter scene’ near by, described together, on top of [W]kotatsu]. a table over electric heater with quilt, also with the cat. The citrus fruit sweet enough to eat fresh was first introduced to Higo ProvinceW, now Kumamoto prefectureW, from China which were cultivated as ‘Kouda mikan’ and offered to the Imperial Court. Later in 15th to 16th century, the mikan trees were grafted to Kishu ProvinceW which developed into great industry of the area. 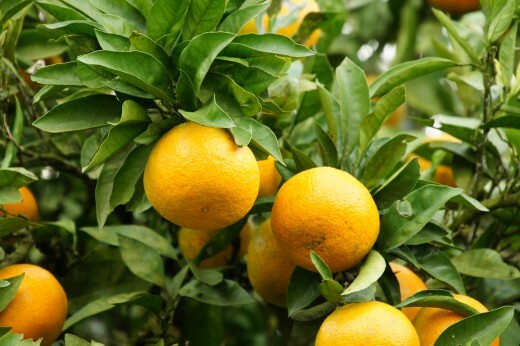 Wakayama prefectureW which was Kishu province in the past, yields the top amount of Mikan in Japan, followed by Ehime prefectureW and Shizuoka prefectureW. It is said that the origin of Mikan that is cultivated in Shizuoka prefecture now was first offered from Kishu province while the first shogunW in Japan, Tokugawa IeyasuW was retreating in Sunpu CastleW in Shizuoka. It is said that the Mikan which Ieyasu planted in his garden became the origin of Mikan in Shizuoka. Toasting the paper to see what’s written in invisible ink…. Photo from Fujitsu Kids Official Site. Because Mikan has been a familiar fruit with the Japanese, there are some old games for children to play with, using Mikan. The most famous game with Mikan is to squeeze the juice from it and use the juice as an invisible ink. 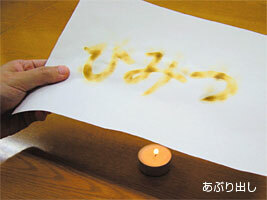 You need to toast the paper you drawn or wrote slightly on a stove (but don’t burn it!) to see what’s on it. The game is called ‘Aburi-dashi’, and was one of the popular games that children played when they had to stay indoors in the bad weather. 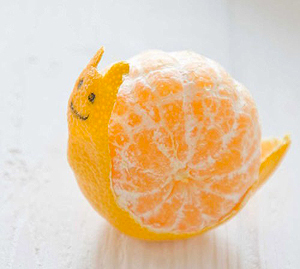 Mikan peel art snail. Photo from ‘Neta-souko, Learning storage‘. There also is a game of peeling the Mikan peel in artistic way. This was only a children’s game or for grown ups to kill their time but became an art these days, known as Mikan peeling art! If you are interested in art-peeling Mikan, there are books on it sold by Shogakukan, one of the major publisher in Japan.